Guided bone regeneration is a predictable method of augmenting horizontally deficient ridges with the use of barrier membranes and composite bone grafts. Periosteal pouch procedure has been used as a guided bone regeneration technique with periosteum used as a pouched barrier membrane to hold the bone graft in close proximity to the decorticated buccal cortical bone. Two cases have been treated successfully using this technique. The first case involves use periosteal pouch to augment deficient horizontal bone with delayed implant placement and in the second case with immediate implant placement. The bone remodeling that follows loss of tooth and/or teeth often results in the loss of alveolar bone. The loss in bone volume is most significant in the first 03 months following extraction of teeth and it progresses with time . An estimated 40% to 60% bone loss occurs in both vertical and horizontal aspects with enhanced bone resorption associated with buccal or labial cortical plates . Guided Bone Regeneration (GBR) procedures use various resorbable and non resorbable barrier membranes in combination with different bone grafts to successfully regenerate new bone. Various studies have shown successful placement of implants in regenerated sites with long term stability . GBR for augmenting horizontally deficient sites can be performed with or without simultaneous implant placement. Some of the challenges include mobilizing the soft tissue flap over the regenerated site and achieving primary wound closure. If the barrier membrane lies exposed to the oral environment there are chances of it getting infected. The other difficulty is securing the barrier membrane over the grafted site due to missing teeth. Bone tacks can be used to secure these membranes but require surgical re-exposure for their removal. The aforementioned challenges can be overcome with the GBR performed using ‘Periosteal Pouch Procedure’. The technique performed in the present case series has been modified from the technique introduced by Steigmann in 2012 . The procedure involves the creation of a periosteal pouch on the buccal aspect of the augmentation site that facilitates holding and securing the bone graft or substitute against the bone required to be augmented. It acts as a pedicled pouch as it is continuous with the adjacent periosteum on the mesial, distal and apical aspects. The overlying flap being a split thickness flap has the advantage of being adequately mobilized to achieve primary closure. The periosteal pouch can also be performed in cases where there is a risk of thread exposure or thinning of the buccal cortical plate during implant placement. In the case series presented here ‘Periosteal pouch’ has been used to augment horizontally deficient sites in case 1 with delayed implant placement and in case 2 simultaneously with immediate implant placement. A thorough case history, clinical and radiological examinations were carried out. The two patients selected for the procedure were non-smokers and systemically healthy. Phase I therapy included scaling and root planning and reinforcement of oral hygiene instructions. They were informed about the treatment procedure and a written informed consent was obtained. A 32 years old male patient reported to the Department of Periodontology with a complaint of difficulty in speaking due to missing front right tooth which he lost a year back when he met with a Road Traffic Accident (RTA). He had also undergone extensive surgeries in his maxillofacial region due to the same trauma which he sustained a year ago and was not in favour of any extensive surgical procedure presently. Examination revealed Seibert’s Class I ridge defect wrt 11 region which was confirmed using bone mapping having a crestal width of 3 mm (Figures 1 and 2). 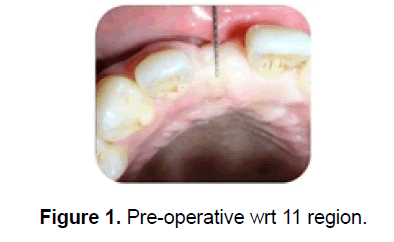 Figure 1: Pre-operative wrt 11 region. Figure 2: Bone mapping wrt 11 region. Surgical procedure: The procedure was done under local anesthesia. A full thickness paracrestal incision was given on the palatal aspect of 11 region which was continued as sulcular incision extending from mesial-proximal to labial aspects wrt 12 and 21 region (Figure 3). A full thickness mucoperiosteal flap was raised up to the buccal crest and continued as a partial thickness flap till the alveolar mucosa. Partial thickness vertical release incisions were given sparing the distal papillae of the adjacent teeth in order to preserve the blood supply of underlying periosteum. The periosteum and overlying connective tissue were slowly detached forming a pouch (Figure 4). Care was taken to keep the periosteum intact and continuous mesially, distally and apically. The buccal cortical plate was decorticated and a composite bone graft comprising of demineralized bone matrix (xenograft) and bioactive glass was mixed with Platelet Rich Fibrin (PRF) and placed within the pouch (Figure 5). The periosteum was sutured with the palatal flap using 5-0 Vicryl (Figure 6). Barrier membrane was placed over the exposed pouch and graft on the crestal aspect and the overlying flap was advanced and sutured using 3-0 Black Braided Silk (Figure 7). Post-operative instructions were given and the suture removal was carried out after 10 days. Figure 3: Paracrestal incision on palatal aspect of 11 region. Figure 4: Periosteal pouch on labial aspect. Figure 5: PRF with composite bone graft. Figure 6: Bone graft placed within pouch and sutured. Figure 7: Passive primary closure of site. Post-operative 06 months CBCT (Cone Beam Computed Tomography) evaluation revealed gain in horizontal width by 3 mm making it 6 mm. A 3.8 x 11 mm implant was placed having good primary stability (Figures 8-11). An Intraoral periapical radiograph confirmed the final implant position. Temporization and non-functional loading was carried out. 06 months post implant placement the patient re-evaluation showed good esthetic and functional result (Figure 12). Figure 8: CBCT at 06 months with bone width of 6 mm. 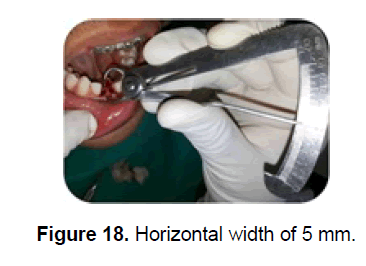 Figure 9: 3.8 X 11 mm implant placement. Figure 10: Primary stability achieved. 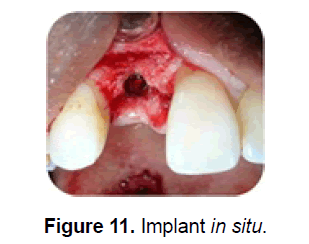 Figure 11: Implant in situ. Figure 12: IOPA radiograph with implant wrt 11 region. The second case was of a 20 years old male who presented with root stumps of retained deciduous 71 and 81 (Figure 13). The mesio-distal distance between 32 and 42 was 6.5 mm and a labio-lingual width of 5 mm confirmed on CBCT, bone mapping and surgical exposure (Figures 14 and 15). The root stumps of 71 and 81 were extracted atraumatically and periosteal pouch was created on the buccal aspect (Figure 16). Partial thickness flap was raised and checked for flap mobility however; vertical release incisions were not given in this case. A single 3.8 x 11 mm implant was placed with good primary stability and non-functional loading was carried out (Figures 17 and 18). The buccal cortical plate was decorticated and a composite graft was placed. Periosteum was sutured, barrier membrane placed and overlying flap secured in primary closure as described in case 1. Post-operative instructions were given and sutures removed after 10 days. Post-operative 08 months the implant is stable and functional (Figures 19-22). The patient was satisfied with the esthetic outcome. Figure 13: 06 months post implant placement. 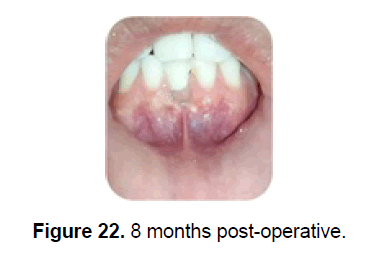 Figure 14: 06 Months Post Implant Placement (palatal aspect). Figure 15: Retained root stumps of 71 & 81. Figure 17: Atraumatic extraction of 71 & 81 root stumps. Figure 18: Horizontal width of 5 mm. Figure 19: Periosteal pouch prepared. Figure 20: 3.8 x 11 mm implant placed & bone graft filled in periosteal pouch. Figure 21: Radiograph with implant in situ. Figure 22: 8 months post-operative. There was no membrane exposure and the post-operative healing period was uneventful. In the 1st case the horizontal ridge width pre-operative was 3 mm which increased to 6 mm at 06 months post-operative (bone gain of 3 mm). This enabled implant placement with primary stability. The case 2 had a labiolingual width of 5 mm and a single implant of 3.8 x 11 mm was placed. The horizontal width being compromised increased the chances of thread exposure due to thinning of the labial cortical plate. Periosteal pouch reinforced the labial cortical plate during implant placement. GBR procedures involve the use of bone grafts in combination with barrier membranes to achieve predictable bone regeneration. An ideal membrane helps in space maintenance to inhibit epithelial and connective tissue cells encroaching and resulting in fibrous repair, cell occlusivity and blood clot stability . 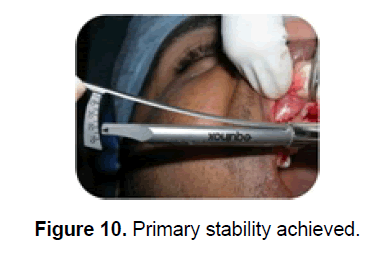 Augmentation of defects of up to 5 mm takes up to 4-6 months. Woven bone is known to regenerate 60 μm per day approximately [5,6]. Absorbable membranes are popular as they avoid the need for a secondary surgery to retrieve the membrane and complications associated with membrane exposure or perforation. Membranes are stabilized or tented around the grafted sites with the use of pins, screws or supporting post . Hence there is need for an ideal absorbable barrier membrane that fulfils all the criteria essential for bone regeneration. Periosteal pouch acts as an ideal barrier membrane and does away with the need for pin or screws for stabilization. It acts as a pedicle and provides enhanced blood supply to the bone graft making it highly predictable. In the 1st case PRF when used in conjunction with a composite bone graft formed a fibrin coalescence which served as a bioactive scaffold with putty like consistence that forms a mouldable mass. PRF is known to be a source of transforming growth factor β-1(TGF β-1), Vascular Endothelial Growth Factor (VEGF), Platelet Derived Growth Factor (PDGF), glycoprotein and thrombospondin-1 . These factors make the procedure predictable and associated with early wound healing. The flap design used in periostal pouch procedure ensures collateral blood supply to the graft, tension-free suturing and primary wound closure. Decortication increases the interface between the bone graft and buccal cortical bone ensuring communication with osteogenic cells. There is an activation of regional acceleratory phenomenon which enhances bone remodeling and turnover. In situations where implant placement renders the buccal or labial cortical plate thinning out; the periosteal pouch procedure can be performed as a preventive measure. The technique has been modified from the original technique proposed by Marius Steigmann in 2012 where the initial incision was given on the coronal most aspect of the ridge whereas in case 1, a paracrestal incision was given on the palatal aspect so that the buccal flap completely covers the grafted site. This design ensures the sutures also lie away from the underlying grafted site . Periosteal pouch procedure as a GBR technique has many advantages that include adequate mobilization of flap to attain primary site closure; it provides adequate stability and vascularity to the graft and does away with the need of stabilizing screws to secure the membrane. Despite the success of this procedure in augmentation of bone in both the cases presented, long term studies with larger sample size are required to validate this procedure as a successful modality of GBR. Chiapasco M, et al. Bone augmentation procedures in implant dentistry. Int J Oral Maxillofac Implants. 2009;24:237-259. Ashman A, et al. Ridge augmentation for immediate postextraction implants: eight year retrospective study. Pract Periodontics Aesthet Dent. 1995;7:85-94. Clementini M, et al. Success rate of dental implants inserted in horizontal and vertical guided bone regenerated areas: A systematic review. Int J Oral Maxillofac Surg. 2012;41:847-852. Marius Steigmann, et al. Periosteal Pocket Flap for Horizontal Bone Regeneration: A Case Series. Int J Periodontics Restorative Dent. 2012;32:311-320. Mellonig JT and Nevins M. Guided bone regeneration of bone defects associated with implants: an evidence-based outcome assessment. Int J Periodontics Restorative Dent. 1998;18:129-137. Berglundh T, et al. De novo alveolar bone formation adjacent to endosseous implants. Clin Oral Implants Res. 2003;14:251-262. Cardaropoli G, et al. Dynamics of bone tissue formation in tooth extraction sites. An experimental study in dogs. J Clin Periodontol. 2004;30:809-818. Hwang D and Sonick M. Guided bone regeneration: concepts and materials. In: Sonick M, Hwang D (Eds. ), Implant Site Development. Wiley-Blackwell, Oxford. 2012;153-178. Dohan DM, et al. Platelet-rich fibrin (PRF): a second generation platelet concentrate. Part II: platelet-related biologic features. Oral Surg Oral Med Oral Pathol Oral Radiol Endod. 2006;101:e45-50.